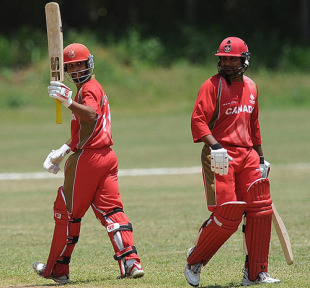 Canada will be the overseas team participating in the inaugural Caribbean Twenty20 tournament between July 22 and 31 in Barbados and Trinidad, Cricket Canada has announced. Apart from Canada, the tournament will include seven regional teams - Barbados, Trinidad, Guyana, Jamaica, Windward Islands, Leeward Islands and Combined Campuses and Colleges. The winner will be the sole representative from the West Indies in the Champions League Twenty20 in South Africa in September. Last year Trinidad and Tobago, the winners of the Stanford 20/20, qualified for the inaugural Champions League in India and finished runners-up. Ravin Moorthy, Cricket Canada's first vice-president, said the tournament was a great opportunity for supporters to fly down from Canada. "Fans across Canada are anxiously anticipating this event and hundreds are expected to flock to the Caribbean to watch the action," he said. "The world's biggest T20 stars, including Chris Gayle and Kieron Pollard, will be taking the field against Rizwan Cheema and the rest of the Canadian stars. This is a great moment for Canadian cricket and something we should all embrace." The eight teams will be split into two groups of four, with each team playing three games in the league stage, and the top two teams in each group qualifying for the semi-finals. Barbados will host the first eight games from July 22 to 25, while the next eight will be held in Trinidad from July 28 to 31. August 1 is the reserve day for the final.